The months from June to November is a time span that has the potential to bring well-known destruction along the Gulf Coast, where memories of Katrina still linger. Hurricanes are destructive forces of nature that will damage or destroy everything that comes in their way with their monstrous winds and torrential rainfall. Inland United States is not free from their effects. Although the Gulf Coast is the most hurricane-prone region, the Mid-Atlantic and New England have certainly seen their fair share of storms. 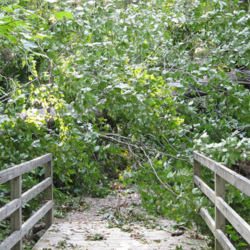 While the Applachian Trail may be rather inland, it too is not spared from many of the effects of Hurricanes.